The study, reported in the Proceedings of the National Academy of Sciences, reveals that cilia in the efferent ductules, which carry sperm away from the testes, don’t propel the sperm forward, as was once thought. Instead, the cilia agitate the sperm to keep them from aggregating and clogging the tubes so that they can reach their ultimate destination. “Motile cilia are eyelashlike extensions of specific epithelial cells and have a beat that moves fluid over a surface,” said Dr. Rex Hess, a University of Illinois professor emeritus of comparative biosciences and a major collaborator on the study led by Dr. Wei Yan, a foundation professor of physiology and cell biology at the University of Nevada, Reno School of Medicine. 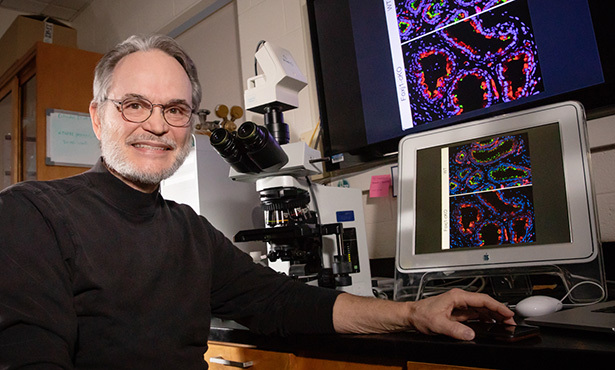 “For more than 150 years, most papers and books on the subject stated that motile cilia of the efferent ductules move sperm cells in one direction, like they do in the female fallopian tubes,” Dr. Hess said. “But we found that the cilia in this organ beat in an unusual manner that stirs and agitates the luminal fluid and sperm. Contraction of smooth muscle lining the ductal walls moves the sperm into the epididymis. When the Yan lab knocked out these microRNAs in mice, the researchers observed that the sperm aggregated into clumps that blocked the efferent ducts. This led to a backup of fluid in the testes, causing male infertility. Read the release on the campus website.